​Leaks on a commercial roof can sometimes be fixed easily, for example debris on the roof may have penetrated the waterproof membrane, drains for water removal could be blocked, and vent and pipe penetrations may need caulking. Central VA Roofing offers a free assessment of your troubled roof. We have a large checklist to follow in the roof’s assessment, some are points of deterioration, compromised accessories in need of repair, safety concerns, mold and rot remediation and debris removal assessment. These and other items on our checklist will be inspected and assessed in detail. Photographs of troubled areas will be taken to aid understanding, and will be included on the written assessment. Our first goal is promoting a cost effective long lasting repair to the fault in the roof or in the event repair is not possible a budget friendly replacement solution will be detailed. ​Even a small leak will interrupt your operations, slow down customers as they maneuver around it, slow employee workflow, cause inventory, equipment, and structural damage. A large leak can be disastrous to your bottom line- insurance does not normally cover full retail value. We will rapidly deploy repair teams to fix a leak. A quick fix will minimize water damage saving you some of the secondary costs which could be attributed to the disaster. We also maintain an 24/7, 365 days a year emergency response team so you’ll have help when you need it. Finally, our assessment of the building’s roof will determine the reliability of the roof’s system- bringing to awareness any potential failures. The greatest concern is ponding water. Since there is no way for water to quickly filter off a flat roof, many novice repairs make the ponding worse. Most flat roofs contain a minor incline to drain the water, but usually it is so slight that any repair not done correctly may impede the water’s ability to flow to the drain ports. Central VA Roofing always checks repairs with flowing water- this helps to give assurance the repair was well done (no leaks and no ponding). 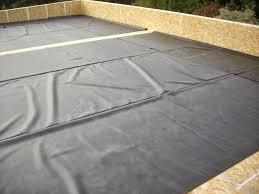 Most flat roofs need replacement at some point because patches on patches just don’t hold up over the long haul. When new leaks are appearing with every storm or once a roofing membrane becomes brittle and splits, it’s really time to consider replacing the roof. Central VA Roofers have been trained and rigorously tested in the implementation of flat roof systems common to this environment- paying particular attention to safety codes for each style. Virginia State Codes have requirements to be maintained for public safety, some are wind resistance, fastening of roof membranes, fire resistance and strength to withstand the weight of snow, ice and water. Consider the irritation of customers constantly getting dripped on by ponding water from the roof in your store or business- they may decide to shop elsewhere. Mold and mildew, another unwelcome natural phenomenon, can always be expected with standing water. Because mold and mildew spores are floating everywhere unseen in our atmosphere, it only takes is a water source to make them bloom. Imagine! customers having to plug their noses against a vile mold and mildew smell in your store. Contact (434) 885-0528 Central VA Roofing by phone, text, or email. We will quickly respond and at your convenience set up a Free, No Commitments, Roof Assessment.